When I was a vego, I cooked heavy on the cheese. Although I didn’t eat a lot of it by itself, it was in or on anything it could be. I remember when I was 13 or so cooking up a pot of thick tomato pasta sauce and thinking to myself ‘What if I added tonnes of cheese to this?’ It was, in the words of Maeve O’Meara, a revelation. It was a habit I had break when I moved in with my boyfriend, who was aghast at how much cheese I put in everything. Very early on in our relationship I made him Pizzoccheri, a dish from of Grandfather’s family made of buckwheat pasta, potatos, cabbage, garlic, and lashings of melted butter, cubed fontina and grated parmesan. And when I say lashings, I really mean lashings. My biggest mistake was letting him watch me make it. Although he said it was lovely, I could see him shudder as I poured about half a cup of melted butter over the dish. Not exactly heart smart. These days my main cheesy outlet is romano or parmesan on pasta – I just can’t help myself. I love how cheese can take a plain, usually carb-based dish and turn it into something special. And this is definitely the case with arepas. Arepas are made all over Colombia and Venezuela and often contain cheese, either mixed through the dough or stuffed in afterwards. They can also be stuffed with a variety of other fillings such as avocado, meat, black beans or fried eggs. They are commonly eaten as snacks or for breakfast but also can form part of a meal. They can be pan fried or deep fried and are both a street food and made at home as they are very easy to make and, in counties with corn as a staple, incredibly cheap. They are also mass produced, in fact, there is even a company in Brisbane that makes them, Grandma ¡Arepas!. Pour the water into a large bowl and stir in the salt. Slowly pour in the white cornmeal. I assume this is to avoid lumps, but I’ve done it in reverse order and there was no discernible difference. Knead the dough until smooth. It will be a bit sticky, so let it sit for a few minutes if you like. Preheat a frypan to a medium high heat. You could also use a bbq if you want to do them all at once. Meanwhile, divide the mixture into 8 balls and shape them by hand into flat patties. They should be the same thickness all the way through, about 1-2 centimetres thick and perfectly round. An easier method is to line an egg ring (for frying eggs) with cling wrap and push the balls of dough into shape using that. 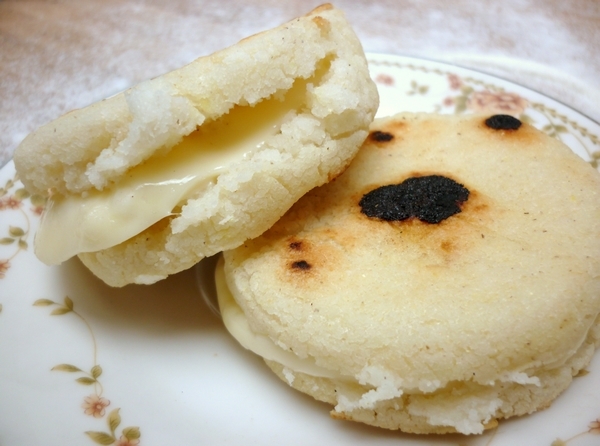 Allow the arepas to cool slightly, cut open and fill with cheese. You can return them to the heat briefly if you want the cheese to melt. What’s your favourite cheesy indulgence? These arepas look muy ricas! Ohhh pizzoccheri! I know they are not the most healthy food, but they are so tasty! I too love cheese… I would eat it on anything. My little girls are just like mommy… the second word my 1 year old learnt was “cheesh”… luckily the first one was “mummy”… probably to call me to ask for the cheese! hehehe Great recipe, very interesting Lauren! Thanks for sharing. @John – I am a street food junkie! Or something. @Manu – That cracks me up, I actually loled when I read that! woops … attached my comment to the wrong spot – meant to be in reply to the Q re where to find the cornmeal. I love cheese too. I usually tend to go overboard with Parmesan, especially when cooking risotto. So good. The best arepas I’ve tried are cheeseless, they’re called “reina pepiada” and are filled with cooked and shredded chicken breast, mayo, onions and avocado. I very much agree on the magic of cheese, as an ingredient and by itself. Thanks for this recipe! Hi, just wondering where you bought the pre-cooked corn meal from?? Is there anywhere you can buy it in Australia? Hi Jennifer. I have found it at a few delis in Sydney, weirdly I found it at Talho Portuguese Butcher (I think) and also Charlie´s deli, both in Petersham. You should be able to find it anywhere that sells latin american groceries, I am assuming that La Cumbia in Kingsford would also sell it. Lauren, I have just found this recipe. It looks gluten free. I am not huge on the gluten free stuff lately, but this looks delicious and I shall cook it. I hope I can find Harina P.A.N – I have never heard of this before! I stumbled on this post trying to find a local cheese for my Arepas. I once tried a cheese from Melbourne they were calling Provole which seemed right, wish I could remember the name. I use the unboiled Masa flour and boil that with plenty of water then salt and butter till the mix is stretchy then I pour the mix into molds. Thanks for the link to Grandma Arepas. I believe I had one of their Arepas at the Colombian Food Festival in Brisbane this year. @empathiser recently posted…Food, love, and war in words. Omg, that’s where I first had arepas too! It was raining and miserable. I think I know the cheese you mean, they have it at my local Woolies, it’s called Mamma somebody’s Provole, can’t remember the exact name. That’s the one! Wish we had that up here. I first had Tamales at the Colombian Food Festival couple of years back. This year I had arepas, tamales, and pork and rice.